Aging is inevitable and often results in everything drooping – including eyelids. 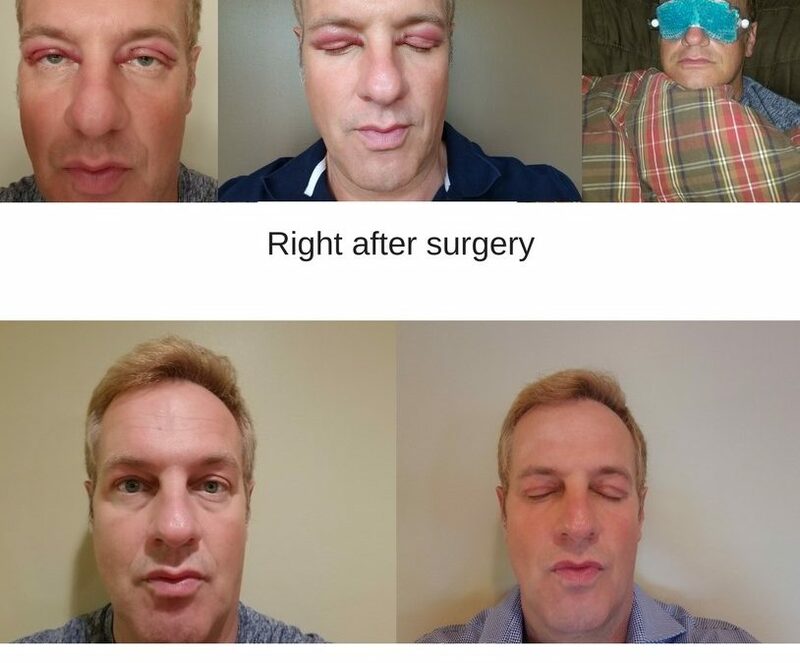 Recently Dr. Steve noticed his eyelid skin drooping down over his eyelashes and obscuring his vision.This surgical procedure is called blepharoplasty. Surgery to correct droopy eyelids is considered cosmetic and will not be covered by insurance unless the lid droop is obscuring your vision. Your eyelid surgeon will determine the amount of vision loss through a series of visual field tests to satisfy insurance requirements or you will have to pay out-of-pocket. Dr Steve’s procedure was deemed medically necessary and was covered by his insurance. Several surgical techniques can be used to correct lid droop. The simplest technique is called a blepharoplasty in which only the eyelid skin is removed. Secondary procedures, usually in addition to the blepharoplasty are often required. These involve shortening of the eyelid muscles to physically raise the lid and sometimes more extensive procedures to also lift the eyebrows. The surgery takes between 30-90 minutes depending on what combination of procedures need to be used. It is an outpatient procedure and requires minimal anesthesia. He was awake during most of it and it was not an unpleasant experience at all. The key to quick healing and minimal bruising is icing. 15 minutes on and off for the first 48 hours followed by warm compresses for another few days. Dr. Steve was back at work in two days but had to limit heavy lifting and any sort of blood thinning pain medications. Right after surgery he first noticed how bright the world was, it was like someone had left a visor off his vision. Two months out from surgery he still has a little bit of swelling which will resolve in the next few months. He is very pleased with the outcome.